Have you wondered how you can conduct Reiki sessions for your clients, family, friends and loved ones when they are not in the room with you? One of the most powerful Reiki symbols is the Distance symbol. Using this symbol in my daily practices, for myself and for my clients has created powerful connections and channels for Reiki to be sent and received, whether I am working one to one with clients, or doing a group distance Reiki healing session in my Facebook community. I am an online Intuitive Life and Business Coach-I love supporting women who are empaths, intuitives, healers, holistic therapists and coaches to fulfil their soul's purpose with unstoppable confidence and ease. By embracing all their superpowers, strengths and vulnerabilities and by clearing out the subconscious and energy obstacles that are in their way around their incredible abilities, they go one to make more money, have incredible success and maintain their energy levels and health. 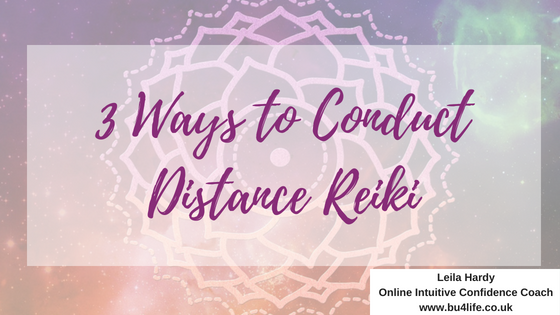 Having a passion for working online has meant I have had to find ways to and build up my confidence working remotely and online, in the moment with clients when conducting distance Reiki sessions. For nearly three years, I've been doing just that and now have a powerful toolbox of techniques to use to be able to conduct powerful and profound distance Reiki healing sessions for others. You may already be aware of the better known techniques, like using a teddy bear as a surrogate for the client, using a photo, or a piece of paper with a person's name on it, but I love to find my own style of sending distance Reiki that has created powerful results for my clients and I always encourage my Reiki students to do the same, whilst staying true to the Reiki principles. I share how to activate and use these techniques in full in my Reiki Level I & II course and Advanced Reiki Training Course, alongside the following, less recognised methods for conducting Distance Reiki that I am sharing below! Which have you used before? Let me know in the comments!